This page is a hub. Use the links below to discover the different types of holiday accommodation that are available in France - a wide choice that goes well beyond just staying in a hotel..
Use our search form to find hotel accommodation in France at the best online rates. A guide to choosing hotels in France, hotel ranking systems, and what to expect. in Paris and other main cities - Strasbourg, Lyon, Nice, Marseille, etc. in other cities: Lille, Avignon, Dijon, Besançon, Cannes, Grenoble, etc. ► From up-market holiday villas and campsites to backpacker hostels and camping "à la ferme", France has an extensive range of different holiday accommodation options. The world's number one tourist destination, France is extremely well equipped in accommodation facilities; it has the largest number of hotels of any western country outside the USA, and a range of hotels varying from the exclusive and expensive to the cheap and friendly.... even sometimes the cheap and unfriendly ! France's Accor group is the largest hotel chain in Europe, and one of the largest in the world. 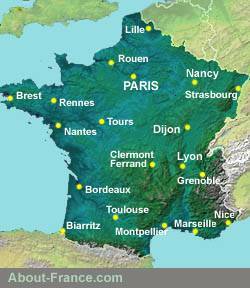 But hotels are by no means the only option for finding accommodation in France. France also has plenty of backpacker hostels and youth hostels, as well as a good network of holiday villages - though these usually cater essentially to French tourists. In rural France, and to a lesser extent in French towns and cities, many local residents, including plenty of English-speaking expats, run friendly and attractive bed and breakfasts. And throughout the French countryside, there are thousands of "gites", the French word used to describe holiday rental cottages. For hikers and cyclists in particular, there are also "gites d'étape", cheap and simple accommodation often fairly similar to the youth hostels of bygone years. About-France.com is a fully independent website committed to providing accurate, objective and useful information about France for travellers, students, and anyone else searching for travel or general information on France or French life and institutions.